First Spring crop of sweet English peas turned into a light and creamy soup with smoky ham. This is my skinny version as I omitted cream as well as butter. You can enjoy two bowls of this creamy Pea Soup with Ham. We hate canned peas. We hate over cooked peas. We LOVE fresh, crisp and sweet English peas. I can always tell when Spring has officially arrived as I find English peas, favas and sweet strawberries in the market. Laudalino and I both love split pea soup but at times it can get clumpy and gooey; not when you use fresh sweet peas! I had intentionally saved some of the ham just for this soup recipe. As we are big texture people, this particular recipe only purees half of the peas and the remainder is added along with the ham right before serving. This recipe is simple and fast and the end result is very good! 1 cup of the pods from the peas – picked over, use the ones that are near perfect, remove the ends. Heat olive oil in a large pot, and add garlic, pods, and shallot. Cook for about 3 minutes. Add 2 cups of the fresh peas and the stock. Remove from heat and puree until smooth in a blender or food processor. Return to pan, add the remainder of the peas and the ham. Return to heat and warm for about 5 minutes. 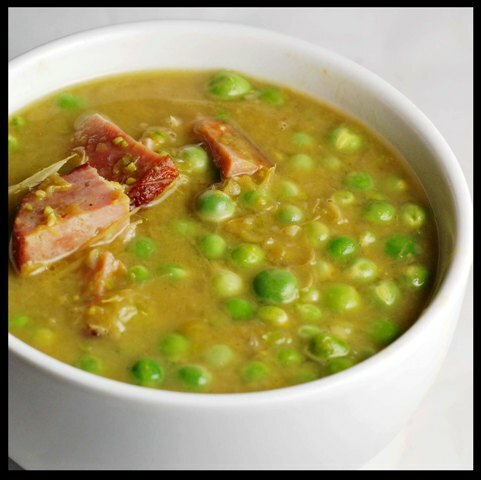 3 Responses to "Pea Soup with Ham"
It's all about texture and taste! You cover both bases with this recipe. Looks delish! This turned out delicious! Thanks for sharing. Thanks Chris! It really is a great spring time soup recipe. Glad you enjoyed.